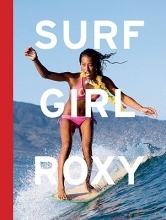 Since its inception in 1994, the Roxy brand has been the tastemaker for girls' beach apparel. Their surf team, "The Roxy Girls," are world champion surfers who epitomize the effervescent fun of being a beach girl. This chunky compendium collects the best photographs of the Roxy girls' exploits over the past decade whether on land or in the water. With over 200 sun-drenched photographs sprinkled with musings on the ocean life by the Roxy team, this volume is a graphic and elegant ode to surfer girl culture.